When Emma Davis reads the words of Isaiah 6:8 in her room at a Georgia women’s college, she understands her true calling: to become a missionary. It is a leap of faith that sweeps her away to Africa in an odyssey of personal discovery, tremendous hardship, and profound transformation. For the earnest, headstrong daughter of a prosperous slave owner, living among the Yoruba people is utterly unlike Emma’s sheltered childhood—as is her new husband, Henry Bowman. Twenty years her senior, the mercurial Henry is the object of Emma’s mad first love, intensifying the sensations of all they see and share together. Each day brings new tragedy and heartbreak, and each day, Emma somehow finds the hope, passion, and strength of will to press onward. Through it all, Henry’s first gift to Emma, a simple writing box—with its red leather-bound diary and space for a few cherished keepsakes—becomes her closest confidant, Emma’s last connection to a life that seems, in this strange new world, like a passing memory. 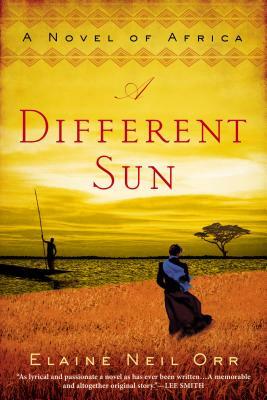 A tale of social and spiritual awakening; a dispatch from a difficult era at home and abroad; and a meditation on faith, freedom, and desire, A Different Sun is a captivating fiction debut. Elaine Neil Orr is professor of English at North Carolina State University in Raleigh where she teaches world literature and creative writing. She also serves on the faculty of the brief-residency MFA in Writing Program at Spalding University in Louisville. Author of two scholarly books and the memoir, Gods of Noonday: A White Girl’s African Life, she has been a featured speaker and writer-in-residence at numerous universities and conferences and is a frequent fellow at the Virginia Center for the Creative Arts. She grew up in Nigeria.